What is Japanese beef WAGYU? Wagyu is a breed of cattle raised with pride and persistence by feeding spesialists in the beautiful and rich natural environment of Japan. Around the world, “Wagyu” is the only quality-enhanced breed known for being unique to Japan and the result of many, many years of combined effort. The mouth-watering taste and rarity of Wagyu quarantees total satisfaction anywhere. Daikichi-shoten, inherit the traditional taste “Oumi Gyu” until now. The half land of Shiga is surrounded with the forest of high mountains. It has about 460 rivers and small rivers, and these are gathered and followed into the biggest and oldest Lake Biwa-ko in japan. In this fertile area, good quality rice is produced for a long time, and Oumi Gyu is also produced there by the skill of superior master. Oumi Gyu that is brought up with rich nature and blessing climate has 400 years history by the forerunner’s effort. 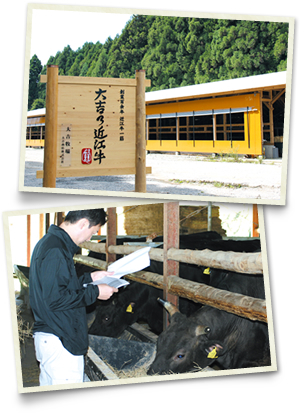 Oumi Gyu is carefully-selected breeding cattle that is bred with the excellent skill which was build up for a long time, with attentive care. The characteristic of Oumi Gyu is fine Kanoko (marbling), it makes the tenderness of the meat texture. The decisive factor of tasting is white shiny fat. This marbling between high quality fat and muscle is melt by the application of heat, and emit a characteristic scent and sweetness. Meantime, it also gives a melting texture. This special kind of texture received good reputation when it is used for Sukiyaki, Stake and Syabu-syabu. Please enjoy the traditional taste of the Oumi Gyu. Though European and American beefs are eaten as chewing well; on the other hand, WAGYU, Japanese beef brand, melts in the mouth. The secret of delicious of the WAGYU is the sashi, fat. mixing with the magenta muscle fiber bundle of the original beef, the state where mottle of the white fat clearly is commonly said, “SHIMOFURI” or “KANOKO”. When the heat is added, the muscle fiber bundle. Therefore, it becomes a kind of feeling which melts. Furthermore simultaneously, by the synergistic action of the melting fat and disentangled muscle, it starts causing the peculiar fragrance and sweetness of WAGYU which cannot be indescribably said. Only this is real pleasure of WAGYU called “WAGYUKHO”.